I have a hard time hearing the word “pita” and not thinking of “Peeta” ever since The Hunger Games. Plus, he gave her bread, so come on now. I don’t know why, but sometimes its damn near impossible to find pita bread in the stores here so I tend to only plan around recipes that use it if I happen to pick up a package ahead of time. But, I never need to do that again! 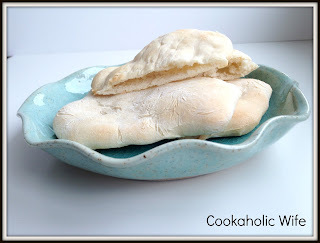 I had no idea making pita bread was this easy. It hardly even takes any time at all and 98% of the work is done by your stand mixer. 1. Combine the water, sugar and yeast together in a small bowl. Let sit for 5 minutes or until foamy, then add in the oil. 2. Meanwhile, combine the flour and salt in the bowl of your stand mixer and attach the dough hook. 3. Add the yeast mixture to the flour and mix on low speed for 30 seconds, or until just combined. Then increase to the next speed and mix for 8-10 minutes or until dough is smooth. 4. Transfer dough to a lightly oiled bowl, cover with plastic wrap and let rise until doubled in size, about 1 hour. 5. Turn out the dough on a lightly floured surface. Roll into a 12″ long rope. Cut into 8 equally sized pieces, then roll out into 6-7″ round circles. 6. Cover with a clean kitchen towel and let rest for 30 minutes. 7. Preheat the oven (and a pizza stone) to 500. 8. Place dough (2-3 of them) on the pizza stone and spritz lightly with water. 9. Bake for 3 minutes or until puffy, but not browned. Remove from the baking stone and let cool on a clean kitchen towel. Repeat with remaining pieces of dough. I had a very hard time deciding what to choose for this Recipe Swap. The potstickers kept catching my eye, as did the general tso’s chicken. But, the pita bread won out when I realized if I didn’t make it now, I’d just print out the recipe, stick it in my to-make binder and promptly forget about it for a few months, like I seem to do with most other recipes. 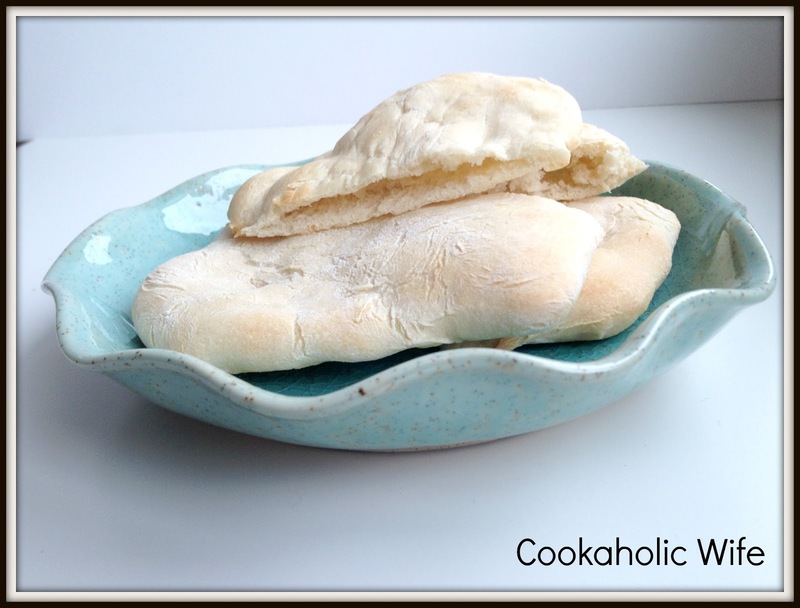 Good pita bread is hard to find! I always thought it was intimidating to make so I never tried-guess not! I'll be trying this soon! Haha, so true about Peeta. This bread looks great! I wish I could get over my fear of working with yeast. These look great! Thanks. Rapid rise yeast and the stand mixer are the only reasons why I ever attempted to try bread. Once it worked, I figured worst case scenario on other recipes is I waste a ton of flour if it doesn't work out.